It seems natural…reward good performance with a promotion. However, super doers, do not automatically translate into super leaders. Super Doers move into their new role and along with additional responsibilities, may take on doing more. They continue doing work because they are good at it. What’s more…when their staff is not doing their own work, the super does takes on filling in the gaps and do their work too! Pitfall: Performance suffers and the super doer, is now stressed and feels deflated. As counter intuitive as this sounds, rather than dealing with a problem employee, managers hope that a promotion eliminates the problem. Of course, this strategy never works and now there’s a bigger problem. For many reasons managers are partial to employees that currently are on their team. The employee is already familiar with the work and there’s comfort going with what’s known verses, the unknown. Employees may even feel “a rite to passage”. Pitfall: Staying within an existing team pool can be limiting. New ideas are not fostered, keeping performance at a status quo. Also, this practice can have employees feeling limited by the options within their teams, resulting in them looking outside the company for their career growth. You’ve seen it before. The people that are highly skilled in managing up. However, when it comes to performance, they are marginal at best. They may even neglect or worse abuse their subordinates. Under these circumstances the manager spends most, if not all, of their energies pleasing the boss. When an opportunity for promotion becomes available the boss automatically moves the person into the spot. In fact, many times bosses create the promotional opportunity. Pitfall: Dissatisfied subordinates are left shaking their heads wondering, “Is management crazy?” Performance suffers and good employees disengage and leave. Some companies are great at posting open positions to all employees. There’s even an internal application and a formal interview process. However, companies miss the mark when they do not effectively complete the process. 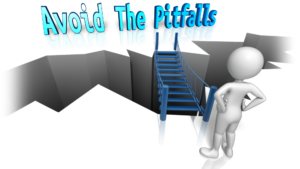 Pitfall: Neglect to explain why an employee was not selected. What are the gaps and what can they work on so they are ready for the next opportunity? The employee is left disheartened and uncertain as about their future with the company. Post the Position Company Wide: This allows for all employees to see opportunities that are happening throughout the company. Employees are more engaged when they know they are not locked in to what is available in their immediate area. Also, attracting talent from areas you may have never been considered, allows for the best candidate to be selected. Structured and Behavioral Interviews: Go beyond the hiring manager. Include peers, executives, and other stakeholders to participate in the interview process. Depending on the level of the job, you might provide a “Business Scenario” for the candidate to present to a panel, or conduct panel interviews. Make certain that the interviewers know how to conduct a behavioral based interview and are using a common rating system. Inform: Communication doesn’t stop with announcing the promotion of the internal candidate. Take time to meet with the other candidates to explain why they weren’t selected. Share the gaps and create developmental plans. Following these Easy Practices results in having the Right Person getting the promotion. Overall employee engagement and retention is enhanced, and performance skyrockets. So why would you do anything else?